For super king-size bed frames, our Posture Pocket Plus mattress gives 275mm of our highest support and comfort at a great price, which is also available in a Supportive version. 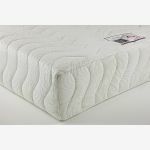 Over 1000 springs distribute the weight individually – ensuring no ‘roll together’ over the course of a night – and are encased in a high density foam box to give true edge to edge support. Topped with a deep 30mm layer of memory foam to give contoured comfort, this large mattress is designed to be no-turn, and to work with our slatted bed frames. Browse our super king-size range that feature a range of finishes to suit all tastes.